We operate weekends 9am to 7:30pm in spring and fall, 7 days a week in the summer from 9am to 9pm. Since 1817 the Lake George Steamboat Company has been offering transportation and sight seeing cruises on beautiful Lake George. Cruises are offered on our 3 large ships from May through the end of October. The Minne-Ha-Ha, one of the last steam paddle wheelers in America, is perfect for kids and families with tight schedules. She takes an hour-long cruise, 7 times a day. 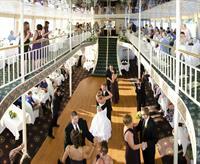 Guests will be delighted with the Minne's authentic steam calliope concert in between each cruise. The Mohican is the oldest continuously operated tour boat in America. 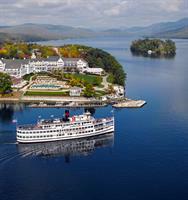 Launched in 1908, the Mohican has been sailing the waters of Lake George for over 100 years. She offers a cruise that tours almost the entire length of Lake George to others that show off the beautiful bays and islands. Family meal cruises are popular and run most evenings during the week (Taco Tuesday, Mac N Cheese Wednesday, Pizza Thursday, and Taco Friday). The 190 foot long Lac du Saint Sacrement is the largest cruise ship on the inland waters of New York State. She offers Monday through Saturday Lunch Cruises and a Sunday Brunch Cruise. In the evenings, head out for a Sunset Dinner Cruise. Our popular Fireworks Cruise launches every Thursday night throughout the summer - weather permitting. All of our ships are available for group tours, charters, private parties, and weddings (of any size!). Group Rates are available; please contact us at 518-668-5777, ext. 205 and info@lakegeorgesteamboat.com.